Lent was never the season that won a popularity contest.� It was thought of as a time of deep purple where Christians should focus on uncomfortable sacrifices, remembering that we are made of dust, and on and on.� It was tolerable, though, because it was preparation for the wonderful event of Easter, when we would then celebrate the resurrection of Jesus from the dead.� That very word had a mysterious tone to it.� It came from the Germanic "Eostre," meaning the dawn of a new day.� It was chosen by the early Christians who saw the rising light of a new day as� symbol of Jesus rising from the dead. The word itself was a tremendous expression of hope--that God had created a world of freedom, that people on this earth can aspire to "escape" and "resurrect," finding new, free lives. But oh, the trials and pains along the way--and that's where Lent came in. �For scripted into this scenario is a price, spelled out in the season of Lent and Good Friday that come before the glory of Easter.� There is no rebirth without first the pain, no resurrection--no Easter--without first the trauma of death. That may sound dramatic, but whose life is spent without a lot of mourning?� Consider the child felled by an illness; the innocent killed in political Holocausts and bloody wars; the parent degenerating into senility; the depression at a discomforting passage in life; the loss of a job; the break-up of a relationship; the drying up of faith; the death of ideals, innocence, of hopes and dreams. Why does it have to be that way?� Why do we have to suffer the Lenten seasons and the Good Fridays?� Why can't things be easier? I don't know.� If I knew the answer, I would be the greatest sage in the world.� All any of us have to go on are the clues we get from our traditions--like Passover and Easter--events in which all the mysteries of life are contained. But most of the time, because we are mere human beings, we see through a glass darkly.� We stumble along� trying to understand the mysteries of pain, with no noonday vision of Eternity to help us along.� Uncomfortable, annoying, miserable, traumatic and tragic things happen.� They are built into human existence. And we protest because our human nature expects and desires that the self and the ego are never put out. Yet, the clear message of Lent and Easter is that the self and the ego have to be jolted or we never come fully alive.� That's the hard truth and the mystery. I remember back in the 80's interviewing Tom Jones, the man who wrote the lyrics for the songs in the lasting musical "The Fantasticks. "� I had always been impressed with the wisdom in his prize-winning song, "Try to Remember," especially the line that says, "Without a hurt, the heart is hollow." He had learned that truth from his own pain, he told me, but added that it was this truth that made� life worthwhile.� For without the dark side, we would never be able to appreciate the light, he said, paraphrasing what the saints had preached down through the ages.� And I recalled what someone once wrote, "A clay pot sitting in the sun will always be a clay pot.� It has to go through the white heat of the furnace to become porcelain." ������ And there is yet another explanation for human pain that makes sense to a person who believes in Easter.� It was spoken by the writer Oscar Wilde, who asked, "How else but through a broken heart can the good Lord enter in? "� He implied in his very question the necessary ingredient for attaining this intimate relationship between us and the heavens. From the "crucibles" of my own life, so specifically the deaths of three beautiful sons, I have come to see Lent as the mosaic of what life is about.� It is given to us as a gift to take an incredible journey of some 40 days where we can gain moments of real insight, unlocking the mysteries of why life is as it is.� In Lent, we are given the freedom to ask questions and cry out our confusions, trusting that God understands--because of the promise that was shouted from His Cross:� You, my people, will not have answers--but something much better: Life forever. In our daily lives we have distractions, pitfalls and so many happenings that make us feel that we are loners.� Lent arrives to show us how wrong that is.� Lent is a love story� showing us that, for all our difficulties and sorrows,� we are not alone--we are forever linked to Jesus, and with Him, ever alive. 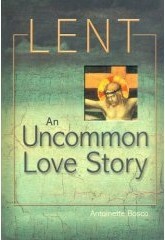 In the chapters of my book, I offer my� own vision of Lent, trying to take away the crusts, the negatives, the emphasis on sacrifice--sometimes artificial sacrifice--that sadly became the context in which we approached Lent.� I hope my stories and reflections will encourage all who read them to focus on their own lives, being surprised, perhaps, to see indeed that Lent, which contains the biography of Our Lord Jesus Christ, can be nothing less than a love story.